We are grinning like a Cheshire cat about our new special giveaway! 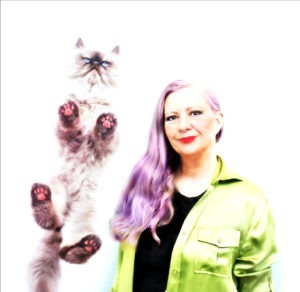 Fern Beauchamp Slack is a vet from Virginia who has mined her healing talents into a new direction. 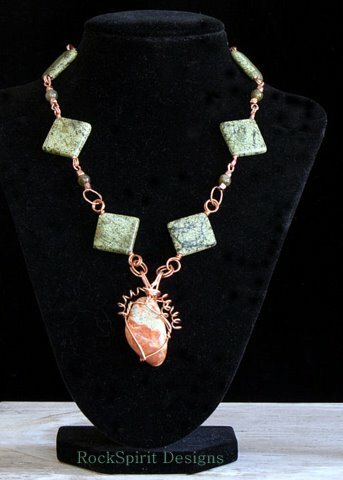 At her new business RockSpirit Designs, Fern hand crafts healing jewelry from earrings, necklaces to collars for pets from natural stones and crystals. See all the amazing designs at Fern’s Etsy shop She will happily do an online consult to make a special piece just for you. One lucky winner will win a custom designed pet collar including a free online health consult for your pet with Fern valued at $150.00. These are a couple samples of the pet collars. Each one is unique. The HealingStone pet collar can bring the beneficial energy of healing stones to your beloved cat or dog when there is a specific issue. They are not a substitute for medical treatment but a natural and gentle way to gently nudge the body back toward wellness, and away from “dis-ease.” Many are helpful for the restoration of energy and relief of stress. We could all use one this holiday season!The base collar is made by Lupine, Inc., and features a breakaway safety cat latch. For pets who don’t like wearing collars, the collar can be placed where they sleep instead for healing benefit. To win, please leave a comment here or at our Facebook page any time until midnight Dec. 3 2011. For extra chances to win,and “like” Fern’s RockSpirit Designs Facebook page share this post on Facebook, Twitter, Stumbleupon, DIGG and/or subscribe to Cat Wisdom101. Good luck! The winner will be announced next Sunday. These collars are lovely & unique. I believe in the healing quality of stones! My little Misty REALLY needs this! She has problems with one eye that flower essences haven’t helped at all. The vet keeps telling me that there’s nothing wrong, but I can tell it’s really bothering her. I really hope I win so Misty can get some relief. 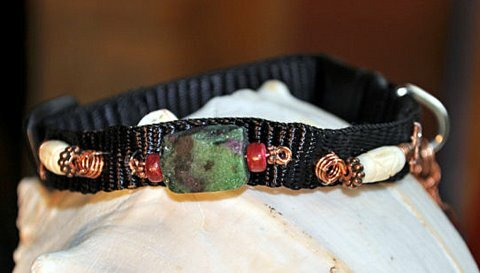 My father created lovely jewelry for humans out of stones and gems before he was disabled. Would love to have a collar that would remind me of him and help a cat! Heather, what a lovely memory! So did my Great Uncle Frank, whom I loved very much. Marg, I appreciate that your ferals won’t wear collars – as if, right? The right stones, on or off a collar, can still be a wonderful influence. For ferals, stones that calm and relieve stress and anxiety, just placed where they hang out, would be happy-making presence! My cat Ryder would just love this beautiful collar. What pretty collars! It would be hard decision as to which cat would get the collar. Those are such beautiful collars and necklaces. We’d love to be entered to win one. Thank you very much! Wow, that really is a nice and beautiful collar. Unfortunately my cats don’t wear collars so don’t enter us in the drawing. I am sure it does some good but these feral cats would not think that was a good idea. But it sure is pretty. It would be great if healing stones were a substitute for more conventional forms of medicine. Instead, think of them as warm sunlight on you on a cold day. You still need clothes, but the sunlight gets you the energy you need to get warm. Sounds like a great idea, and they are beautiful, too. They sure beat trying to get a pill down a cat’s throat! Those are certainly unique, not to mention pretty! I would love to win this–both of my cats are nearing 10 years of age, which is a milestone for them and me! I’m so delighted to hear that! It’s not the first time I’ve heard it. It makes me very happy to have provided Jasmine with a source of comfort — and hopefully you too! What a beautiful collar! My Jasmine would look gorgeous in it! Thank you! Beauty is healing in and of itself. I would love to enter this lovely contest. Fern was so helpful this summer to us when we had sick foster kittens. Glad to be of help, Rachel! Please enter, and best of luck! Beautiful collars. Love their healing powers through the stones. Two of my three cats have medical issues so would love if they could wear your collars. Thank you! Best of luck in the contest! 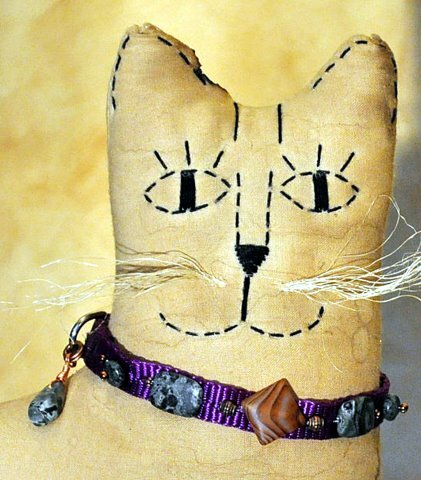 Fern was Buckley and Amber’s vet before she channeled her healing and intuitive talents to harnessing the healing power of stones in the form of absolutely stunning jewelry for humans, and these collars for pets. With these collars, you get her veterinary expertise, along with her vast knowledge of the healing properties of stones, all in one beautiful package. Who wouldn’t love these? Thank you, my dear. It’s always an honor to be your friend and professional associate. Your work for cats everywhere is amazing! Ingrid, thanks for adding another level of understanding. @Fuzzy Tales, yes you can enter. @Kathryn, for those who don’t like collars, the collar can be laid flat where they sleep. @Mary, the best news is our vet comes to our home since Merlin hates going in a car. Hi Layla! Thanks for the comment about sunbathing cat in Japan! Well according to my mother those cats dissapeared with the house…no one really knows where they went…I am sure they went to next favorite sunbathing spot!! Your pet collars are beautiful! I love the idea of them, too. Very beautiful collars. I’d especially like my eldest cat to wear one due to the healing properties of the stones; he’s been ill and under our Vet’s care for the past 2-months. I am so sorry to hear your eldest is sick. I’ve been through that recently and it was excruciatingly difficult. I wish you luck in the contest; failing that, you can check out my Etsy shop and we can talk about something special for your beloved fuzzy child. Those are beautiful pet collars! I can imagine some nice felines would wear them. Our boys, sadly, are not nice quite in that way. Thank you Kathryn for your kind words about my work. I have found that the collars can be equally effective if placed in an area where your cat spends a lot of time — where she likes to sleep, for example. Once a stone is attuned to your cat, it doesn’t need to be right next to her to work — just in the general vicinity is helpful. Some cats will even seek out the stones to sleep near them.